Last weekend warm weather teased Atlanta with the promise of Southern spring. Then temperatures dropped into the thirties and it rained most of the week. The grass at the park is still dead and wet, but the sunset is slowing further into the evening. I can think of nothing more appropriate to eat in the awkward end of winter than a pot of low and slow simmered collards. For most of my adolescence my mom dated a man from Athens Georgia. He created a feast every Sunday and he almost alway cooked collards. I did not eat them. I was scared of their scent, smokey, grassy, even muddy. The color was odd to me, "Shouldn't green foods be green?" I thought. I tried several times, but found their texture off putting. The first pot of greens I ever enjoyed happened much later in my life. I was living here, in Atlanta, at that point. It was recipe testing for a book. Ironically, they were everything I described above - smokey, earthy, hearty - but their texture had more contrast. 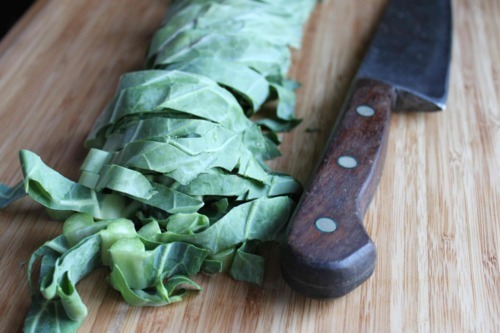 I enjoy collard greens in more ways now than just a side dish for fried chicken or as part of Hoppin John on New Years. They make a lovely bed for a fried egg. They are great in soups, lasagnas, burritos... the list goes on and on. Recently I've taken to cooking a large pot and freezing the leftovers in quart sized ziptop bags. They thaw quickly and make quick weeknight meals taste like a Sunday supper. 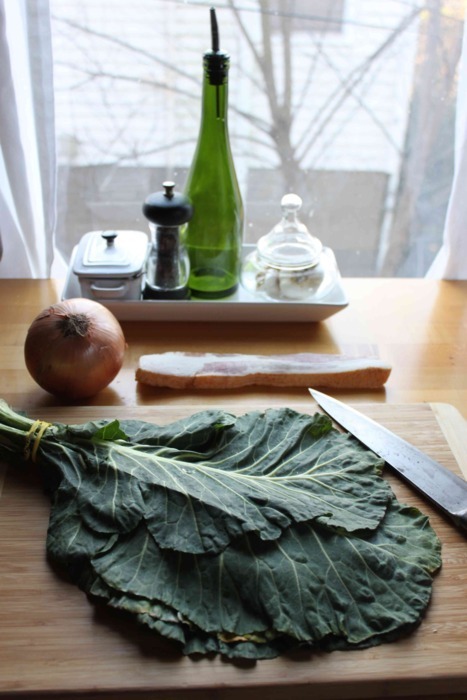 I know kale has been getting a lot of positive press these days, but I'd urge you try a pot of collards for the same nutritional but more soul soothing affects. Wash the greens thoroughly: If you use packed shredded greens - submerse in a sink of cold water, agitate rapidly with your hands and then let settle for about a minute (any dirt should settle to the bottom of the sink). Dry throughly in salad spinner or clean kitchen towels. If using whole leaves, rinse under cool running water, dry throughly and then chop by first stacking then rolling the leaves and slicing into thin ribbons. Heat the bacon in a large cast iron dutch oven over medium heat until some fat has rendered - about 3 minutes. Add the onion and sweat until tender, another 2 minutes. 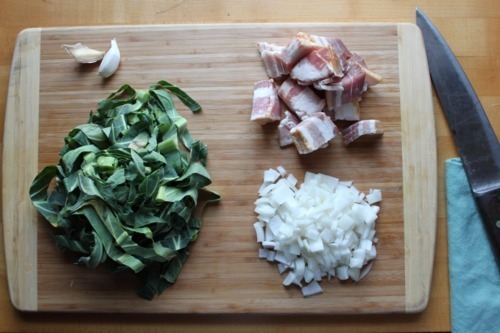 Add the garlic, greens and water. Bring to a simmer, cover, and cook 35 to 45 minutes, stirring every 10 minutes, until the greens are tender. Hi, When it's come to talk about cleaning the kitchen sink, then it's annoying to me. Recently someone suggests me to visit here and said I could found here some useful tips about cleaning the kitchen sink. If you had more insight into it, I would much appreciate it. Thank you.